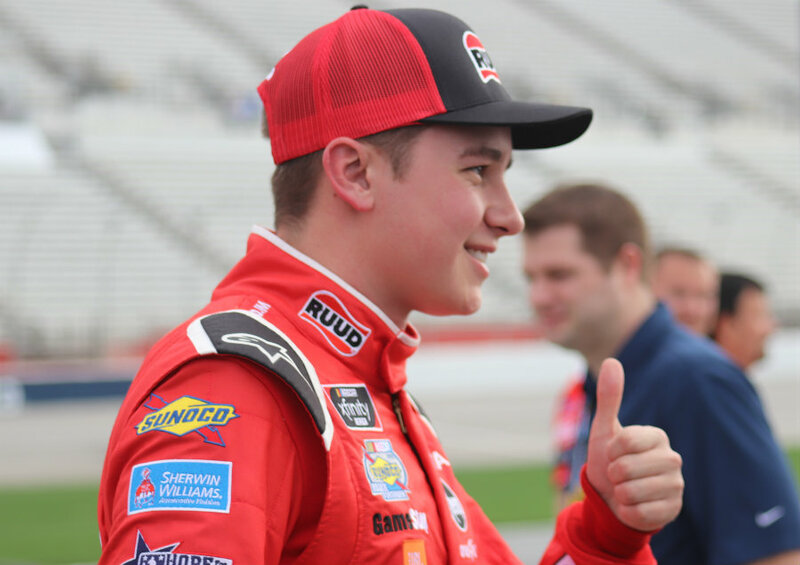 Christopher Bell ran the fastest lap in the opening session of Xfinity Series practice. He was the only Toyota in the top five. Christopher Bell, driver in the No. 20 Ruud Toyota for Joe Gibbs Racing, ended the first practice session of the day for the NASCAR Xfinity Series with the best speed of 178.447 mph and a lap time of 31.068 seconds. Bell ran the most laps of the session with 37. Bell led the practice session as the only Toyota in the top five, followed by four Fords. Joey Logano, in the No. 22 Discount Tire Ford for Team Penske, ran second the whole first practice session with a speed of 177.323 mph, 31.365 seconds. 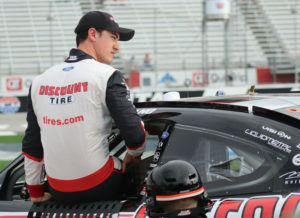 Logano ran a total of 15 laps. 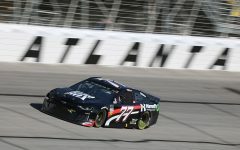 Cole Custer had the third fastest speed of 175.933, 31.512 seconds, in the No.00 Haas Automation Ford for Stewart-Haas Racing. Ryan Reed, driver of the No. 16 Drive Down A1C Lilly Diabetes Ford for Roush Fenway Racing, ran third with a speed of 175.688 mph, 31.556 seconds. Kevin Harvick finished out the top five with a speed 175.487 mph, 31.592 seconds in the No. 98 Hunt Brothers Pizza Ford for Biagi-DenBeste Racing. Last week’s winner, Tyler Reddick, ran the second most laps (31) with a top speed of 175.388 mph, 31.610 seconds, finishing 6th in the session. Elliott Sadler, runner-up from a week ago, ran a speed of 174.219 mph, 31.822 seconds. His time was fast enough for 13th in the opening Xfinity Series practice. Atlanta’s Brandon Jones, ran a speed of 174.126 mph, 31.838 seconds, landing him 15th for this session. From Tucker, Ga., Ryan Sieg ended the first practice session in 23rd with a speed of 169.195 mph, 32.767 seconds. Peachtree City driver Garrett Smithley did not turn any laps in the first practice session. The final Xfinity Series practice starts at 3:05 p.m. later today. Brandon Jones, driver from Atlanta, talks with Dana Gould after the second Xfinity Series practice session. Jones, in the No. 19 Menards/Jeld-Wen Toyota, rounded out the top five with a speed of 175.950 mph, 31.509 seconds. John Hunter Nemechek, driving the No. 42 Fire Alarm Services Inc. Chevrolet for Chip Ganassi Racing, finished out the second practice of the day for the NASCAR Xfinity Series with the best speed of 178.516 mph, 31.056 seconds. Nemechek ran the most laps of the session with 49. Christopher Bell, who led the first practice session, ran second with a speed of 177.164 mph, 31.293 seconds in the No. 20 Ruud Toyota for Joe Gibbs Racing. Bell ran a total of 24 laps. Cole Custer, driver of the No. 00 Haas Automation Ford for Stewart-Haas Racing, ran third with a speed of 176.887 mph, 31.342 seconds. Ty Dillon ran fourth with a speed of 176.887 mph, 31.443 seconds. Brandon Jones, in the No. 19 Menards/Jeld-Wen Toyota, rounded out the top five had a speed of 175.950 mph, 31.509 seconds. Bell, who after the first practice spoke about the need for long-run speed, finished second on the speed chart for ten-lap averages with a speed of 172.404. Only Nemechek could top that, averaging 172.687 mph in a ten-lap span on fresh tires. Kyle Benjamin in the No. 18 PEAK Antifreeze & Coolant Toyota for Joe Gibbs Racing, ran third in ten-lap averages with a speed of 172.192 mph. Richard Childress Racing had both cars in the top six with Dillon fourth and Matt Tifft, driver of the No. 2 Surface Sunscreen Chevrolet, finishing sixth. All three Toyotas from Joe Gibbs Racing finished in the top-ten for the session. Two Monster Energy NASCAR Cup series drivers will pull double-duty this weekend. Joey Logano, who drives the No. 22 Discount Tire Ford for Team Penske, finished 11th with a speed of 174.890 mph, 31.700 seconds. Kevin Harvick ran 13th with a speed of 174.526, 31.766 seconds in the No. 98 Hunt Brothers Pizza Ford for Biagi-DenBeste Racing Racing. For Georgia drivers, Garrett Smithley, No. 15 for JD Motorsports, placed 28th overall in the second session with a speed of 168.015 mph, 32.997 seconds. Ryan Sieg, driver of the No. 39 Georgia Metals Inc./Atlanta Compressor Chevrolet for RSS Racing, ended in 30th overall with a speed of 167.863 mph, 33.027 seconds. Qualifying for the Xfinity Series starts at 9:10 a.m. tomorrow morning. Xfinity Series rookie Christopher Bell gives a thumbs up after finishing qualifying with the fastest lap time. Bell has maintained some of the top speeds throughout both practices and qualifying. 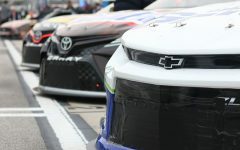 Xfinity Series rookie Christopher Bell, who showed consistent speed throughout both practice sessions yesterday, captured the top starting position for this afternoon’s Rinnai 250 at Atlanta Motor Speedway. The driver of the No. 20 Ruud Toyota for Joe Gibbs Racing finished qualifying with a lap time of 30.600 seconds (181.176 mph). Joey Logano, driver of the No. 22 for Joe Gibbs Racing, climbs from his car after the third round of Xfinity Series qualifying at Atlanta Motor Speedway. 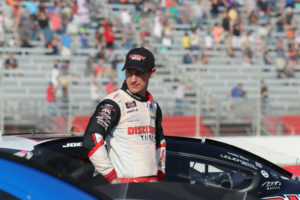 Logano had the fastest lap time until the last seconds of qualifying when 20-year-old Christopher Bell knocked him from the top stop. Joey Logano of the No. 22 for Team Penske finished qualifying with the second fastest lap time of 30.630, only 0.03 seconds behind Bell. John Hunter Nemechek, in the No. 42 for Chip Ganassi Racing, finished qualifying with the third fastest time of 30.669 seconds. Cole Custer of the No. 00 for Stewart-Haas Racing narrowly edged Kevin Harvick, one of three MENCS drivers pulling double-duty this weekend, by 0.001 seconds for the fourth starting spot. Brandon Jones, driver of the No. 19 for Joe Gibbs Racing, finished seventh in qualifying. Last weekend’s Daytona winner Tyler Reddick of the No. 9 Chevrolet finished 11th. Justin Allgaier of the No. 7 for JR Motorsports will start 17th in the race later today after failing to make the last round of qualifying. Garrett Smithley, in the No. 15 for JD Motorsports, finished 32nd in qualifying. He did not run in yesterday’s first practice and finished 28th in the final practice. Ryan Sieg, driver of the No. 39 for RSS Racing, finished 25th, missing the second round of qualifying by 0.152 seconds. Mike Harmon in the No. 74 Shadow Warriors Project Chevrolet for Mike Harmon Racing and Josh Bilicki in the No. 45 Prevagen Toyota for J.P. Motorsports failed to post a time fast enough for today’s race. NASCAR’s only double-header of the season begins this afternoon with the Xfinity Series Rinnai 250. The green flag is set to fly at approximately 2 p.m.
Xfinity Series rookie Christopher Bell battled against MENCS veteran drivers throughout the day. The driver of the No. 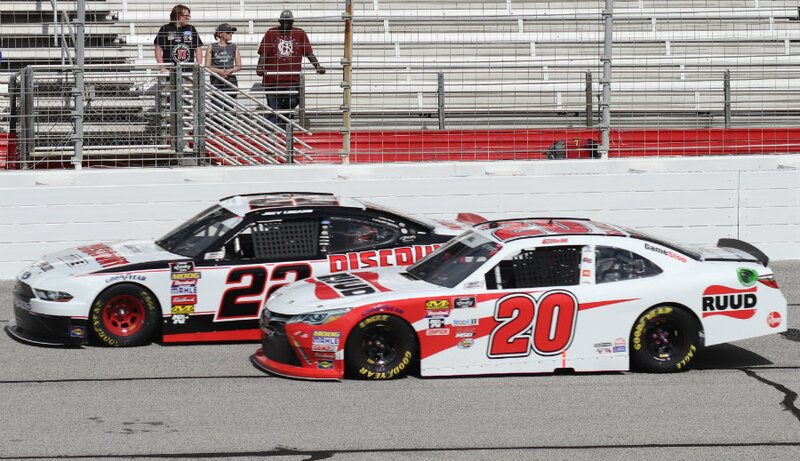 20 Ruud Toyota from Joe Gibbs Racing finished third behind runner-up Joey Logano in the No. 22 Discount Tire Ford after Kevin Harvick dominated the race. Kevin Harvick, in the No. 98 Hunt Brothers Pizza Ford for Biagi-DenBeste Racing, dominated the Rinnai 250 at Atlanta Motor Speedway. Harvick won all three stages and led a race-high 141 laps. Harvick celebrates his 47th NXS career win. 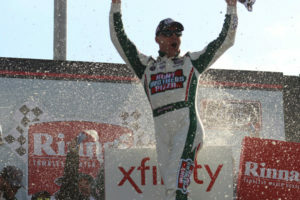 Harvick led 141 of 163 laps, dominating the 27th Annual Rinnai 250. The real battle on the track took place between Joey Logano in the No. 22 car for Team Penske and Christopher Bell in the No. 20 Toyota for Joe Gibbs Racing. Bell maintained the second position behind Harvick, and even closed in on the leader late in the race, but scraped the wall with six laps to go, causing him to lose the runner-up position to Logano. John Hunter Nemechek, in the No. 42 Fire Alarm Services Inc. Chevrolet for Chip Ganassi Racing, finished fourth in his first NXS start at Atlanta Motor Speedway. Elliott Sadler, driver of the No. 1 Cessna Chevrolet for JR Motorsports, finished fifth, and now leads the Xfinity Series points by four over teammate Tyler Reddick. Justin Allgaier, Austin Cindric, Kyle Benjamin, Ryan Truex, and Ryan Reed rounded up the top ten. 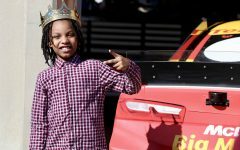 “[A]s the race went on, I got more and more into a rhythm of being able to run the yellow line,” Nemechek said. Joey Logano on pit road after finishing second to fellow MENCS driver Kevin Harvick. Logano led first until Harvick surpassed him near the end of Stage 1. Cole Custer, driver of the No. 00, started third but quickly dropped back before wrecking on lap nine, bringing out the first of four cautions in the race. The caution brought the field together only temporarily, because when it went back to green, Harvick, Bell, and Logano quickly pulled away from the field. 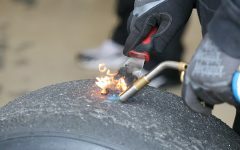 Nemechek, who struggled early in the stage after contact with Custer on lap nine forced him to pit due to a cut tire, benefited from the caution at the end of Stage 1. He used Stage 2 to rally back up through the field. Harvick, Bell and Logano continued to be the class of the field throughout Stage 2, with Harvick leading all 40 laps. A battle developed between Truex and Allgaier, as Allgaier moved up. 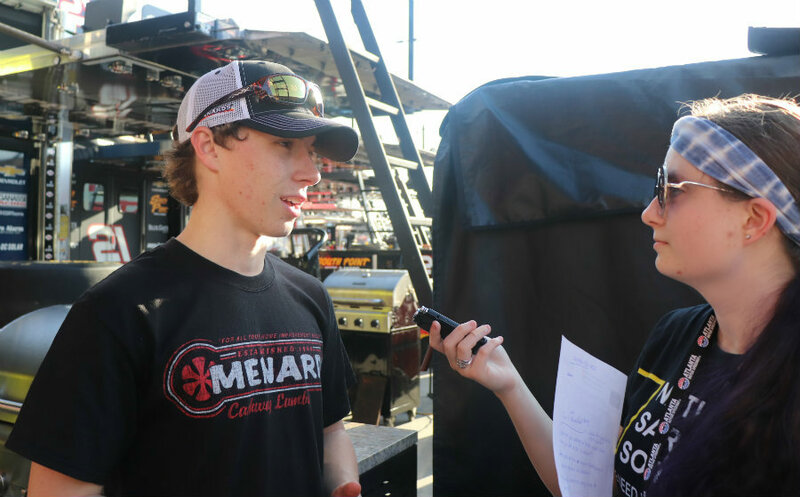 Meanwhile, Nemechek slowly recovered from the Stage 1 trouble and worked his way up to 15th place. After pit stops, Nemechek restarted in 11th place. With 57 laps to go, Harvick, Bell and Logano continued to set a blistering pace. When pit stops approached with 45 laps to go, Bell gained on Harvick, but it was not enough. After the cycle of green flag pit stops, it was still Harvick, Bell, and Logano. Tyler Reddick, last weekend’s winner at Daytona, blew a tire late in the race, forcing him to pit, and relegating him to a 19th place finish, two laps down. The mishap also cost him the overall Xfinity Series points lead. By the end of the race, only seven drivers remained on the lead lap. In total, the race had nine lead changes among the top three drivers. Despite the win, Biagi-DenBeste Racing does not plan to change its plans of running a limited schedule this season. Ryan Sieg from Tucker, Ga. finished 22nd after starting 25th. The Xfinity Series heads west next weekend for the Boyd Gaming 300 at Las Vegas Speedway. The race starts at 4 p.m. on Saturday, March 3.